It is a special branch that deals with the study and application of imaging technology using X-ray radiations or such other radiation devices for the purpose of obtaining visual information to diagnosing and treatment of diseases. X-ray machines are devices that generate exceedingly high frequency high energy electromagnetic waves that penetrate the body during medical procedures to provide visual information. The x-ray tube working principle and diagram is shown below. Generation of X-rays in X-ray tubes. An X-ray generator is a device used to generate X-rays .An X-ray imaging system consists of an X-ray source or generator (X-ray tube) and an image detection system. 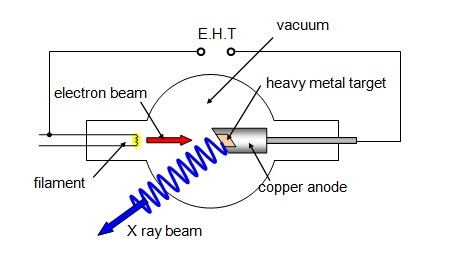 The X-ray tube (high vacuum diode) operates by emitting electrons from a heated cathode tungsten filament toward a rotating high voltage anode disc. The point where the electrons (beam) strike the target is called the focal spot. At the focal -spot X-ray photons are directed at all directions. X-rays arise from the target disc at right angles and are focused by a collimator. For more viewing contrast we use, photomultipliers. The images are received and viewed on a photographic plate. Here light and dark areas on the film represent high and low tissue penetration. The basic schematic of an X-ray tube is shown below. X-ray machines work by applying controlled voltage and current to the X-ray tube. So the beam intensity of X-rays can be controlled by controlling voltage or current. The beam is projected on the object. Some of the beams will pass through the object and some are absorbed. The resulting pattern of radiation is detected in a photographic film as told earlier. In an X-ray tube, the rotating anode is used to overcome the overheat problem. Also the anode is made of tungsten alloy which helps in avoiding over heat.